Having had to wait the longest to play at this year’s World Cup, you would have thought Russia and South Korea would have been chomping at the bit to get involved in all the footballing fun. Evidently not. 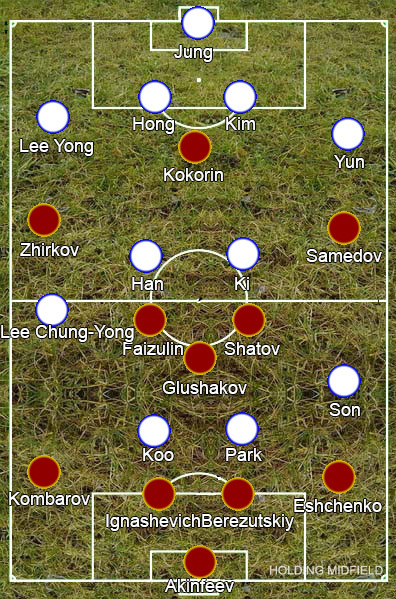 Fabio Capello sent out his team in a 4-3-3 with Yury Zhirkov and Alexander Samedov wide of Aleksandr Kokorin, while South Korea were set up in a 4-4-2 for an embarrassing first half of football. Badly missing Roman Shirokov in midfield, Capello has called upon some thoroughly average players to make up his side and they spent the entire half hitting cross-field balls to Zhirkov, who impressed from full-back but is fairly run-of-the-mill on the wing, and Samedov, who simply is a run-of-the-mill winger. This is shown quite perfectly by this diagram of the average positions of Russian players’ touches taken roughly 30 minutes into the first half. South Korea were the better of the sides, but that wasn’t saying much. They kept the ball well, but did it through safe, square passing done as much out of cowardice as a desire to be a passing team. Son Heung-Min provided the brightest sparks – positioned higher on the left than his fellow midfielders, he would come inside as Park Chu-Young went outside, taking advantage of the Russian defence’s lack of mobility. The game was worthless until the introduction of Alan Dzagoev for Oleg Shatov, the Russian equivalent of bringing off Jermaine Jenas for Paul Gascoigne. Just one of Dzagoev’s little touches was more than Shatov has produced in his entire career. Dzagoev’s role in getting Russia attacking can be partially blamed for the goal they conceded however. 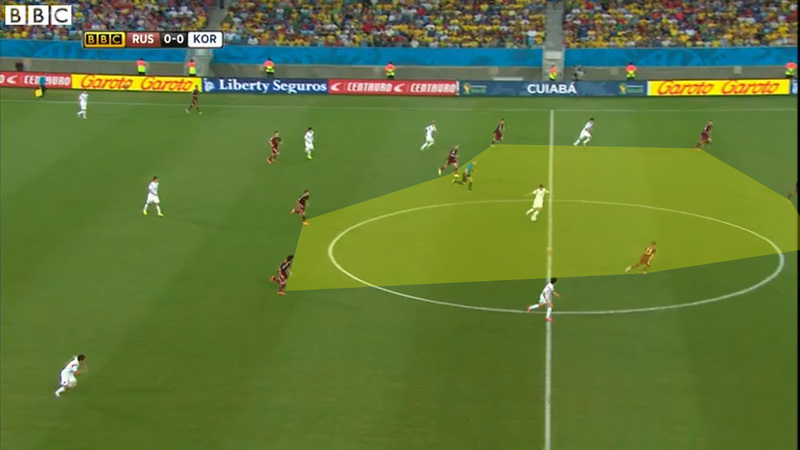 The change in formation and added attacking impetus that came with the addition of Dzagoev into the game saw Russia’s midfield caught high up the pitch and Lee Jeun-ho had space between the lines. He picked up the ball as the Russian defence backed off further and further before hitting a speculative shot straight at the keeper. Not content with constantly spilling balls, Igor Akinfeev let this one go straight through him somehow. It was bad defending punished by bad attacking thanks to bad goalkeeping. Russia of course grabbed one back as clever forward Aleksandr Kerzhakov scrambled the ball into the net immediately after coming on as a substitute, set up by some nice footwork by none other than Dzagoev, and Russia dominated the latter period of the game. All three of Russia’s substitutes should really have started the game and it stands as a missed opportunity in a group lacking in quality that they haven’t beaten the easiest team in the group.